What makes Chicago’s independent music scene one of the most unique in the world? How can independent artists educate themselves on the legal details of performing live? How can fans support the local music scene and learn more about how lawyers are helping musicians in the Windy City? 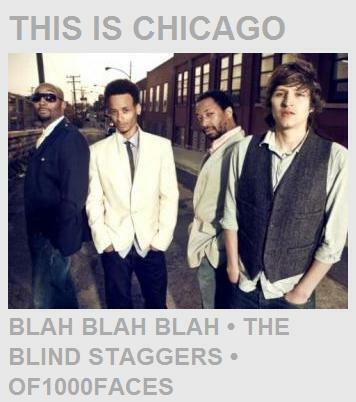 Well, there are a lot of reasons why Chicago is one of the best cities for independent music. And besides the diversity of the music scene, I get excited when the local music community can come together to support each other and give fans the chance to experience more than just a solid showing of new music. Presented by our friends at CHIRP radio, This Is Chicago concert series will take place at the Bottom Lounge on September 16. The musical side of the event will feature up-and-coming Chicago bands: Blah Blah Blah, The Blind Staggers and the debut of Matt Walker’s (Smashing Pumpkins, Morrissey) new artist collective of1000faces. Also partnering with Bottom Lounge on Thursday night is lawyer4musicians.com, a site that focuses on helping musicians navigate the treacherous and often confusing legal waters of getting gigs and signing performance contracts. This duo of lawyers helps give artists the legal guidance they need. And in light of the recent Lollapalooza radius clause story, legal knowledge is a weapon all bands should have in their arsenal. Lawyers 4 Musicians also have some helpful tips for bands looking to grow their community of fans besides playing Lollapalooza. And you can get to know the guys here. What Live Legal Questions Do You Have? Besides telling you about This Is Chicago, we’d like to continue the conversation here on Live Fix. So if you’re a fan or a musician, we’d like know what questions you have about the legal details of performing live. Go ahead and post your questions in the comments below and we’ll work to set up a future Live Fix interview with Lawyer4musicians and hopefully get your questions answered. Or if you’d like to email your questions, you can send them to chris@christophercatania.com.